With the right support, students can learn to take charge of their digital lives. See how schools across the country are integrating digital citizenship skills into their classrooms and communities. Check out these inspiring stories from teachers, schools, and districts like yours, and learn how you can empower your students to be confident learners and leaders in the digital age. In 2015, Jurupa Unified School District (JUSD) launched the Digital Gateway Initiative to put a Chromebook in the hands of every student in grades TK–12. 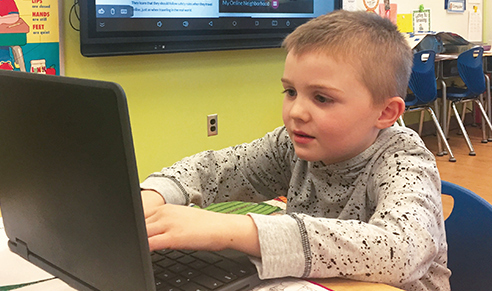 With year-round access to the devices and integrated digital citizenship instruction, this extensive program expands learning opportunities and gives students and families a sense of ownership and responsibility for the technology. Manteca Unified School District has embraced digital citizenship instruction in every school and for every student. As part of one of the most comprehensive one-to-one technology programs in the state, the district's "digital driver's license" is a set of guiding principles for everyone involved in the district's technology initiative, from school and district staff, students, and parents to the greater community. In 2014, Omaha Public Schools (OPS) made a bold move to focus on increasing equity and access to learning technology for its students, a majority of whom are classified as economically disadvantaged. And with new devices came the imperative for responsible device use, which OPS was ready to face head-on. #MontourProud: It's a hashtag that represents an entire community's commitment to using social media responsibly and respectfully. And it's just one of the many ways the Montour School District has made digital citizenship a priority and empowered students, parents, and teachers to think critically and act responsibly online. Marie Belle Vargas has made it her mission to level the playing field for the kids and families in one of the poorest neighborhoods in the nation. Regardless of their access to devices or internet at home, she aims to give students at PS1X Courtlandt School in the South Bronx, New York, the tools they need to succeed in a world of media and technology.